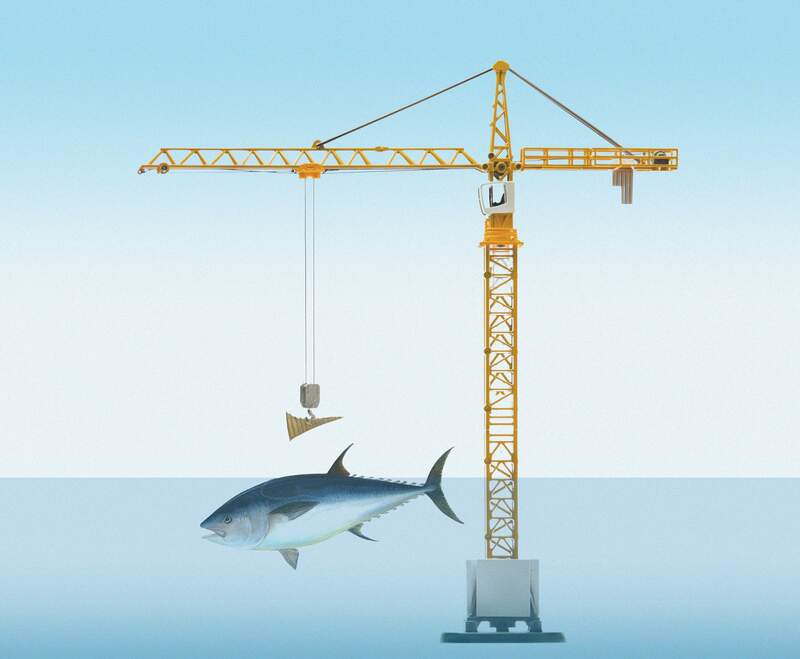 Can scientists build a blueprint for bluefin tuna? Mike Selden checks on bluefin tuna cultures in a storage device at the Finless Foods lab. Jennifer Tang inspects tissue cultures of bluefin tuna samples at the Finless Foods lab. Bluefin tuna is processed at ABS Seafood in San Francisco. 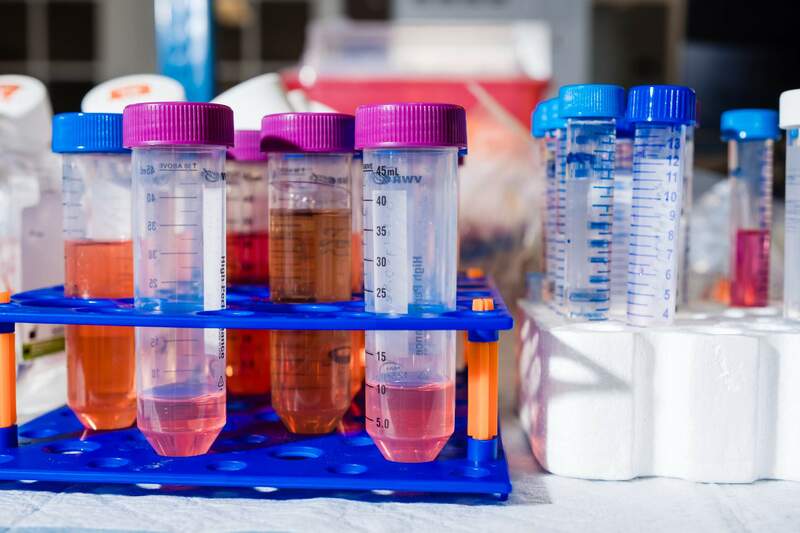 Beakers hold culture samples that may one day be developed into bluefin tuna meat at Finless Foods. Brian Wyrwas, left, and Mike Selden, founders of Finless Foods. For several years, biotech companies have been promising “clean” meat, “cell-based” meat, “cultured” meat – whatever you want to call it – as a way to enjoy the taste of chicken, pork and beef without the brutality of animal slaughter or the environmental damage of big agriculture. But what about fish? 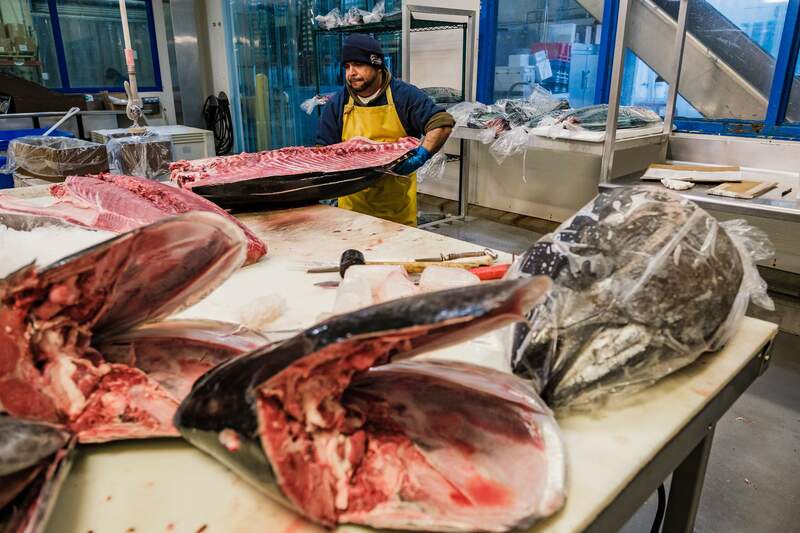 What about something as prized as buttery bluefin tuna, a delicacy that has become the forbidden fruit of the sea because of the many threats that have landed the fish on threatened and endangered species lists? No, to get an uncontaminated sample, Wyrwas has to head out to sea. Wyrwas, 26, and his Finless co-founder, Mike Selden, 27, don’t like to talk specifics when it comes to sourcing bluefin tuna samples. In the competitive, tight-lipped market of cellular agriculture, no company likes to volunteer information that it earned the hard way: Through scientific trial and error or, in Wyrwas’ case, through countless hours sitting on boats, fighting the elements and his sterile equipment to secure a quality sample that could, hopefully, provide healthy stem cells. Artificial advantagesEven once he succeeded, Wyrwas and the Finless team had to learn how to culture, or grow, bluefin tuna cells without the actual animal. Without the fish’s natural habitat. And without the fish’s standard diet of squid, mackerel, herring and more. The scientists had few blueprints to follow. The challenge ahead: to produce the fish in large quantities – and in a form that sushi lovers would recognize. Texture and tasteIn 2013, when Dutch researcher Mark Post debuted what would become the world’s most famous lab-grown meat – a 5-ounce beef patty mixed with bread crumbs – the response from tasters was tepid. Which was not surprising. The beef was grown without any fat. Regardless, the tasting was designed more as a public-relations stunt to drum up interest in an emerging field that promised to give diners their meat with fewer of the harmful side effects – such as greenhouse gases, animal waste, reckless use of freshwater resources and animal suffering – of big ag. But that staged burger tasting – especially the resulting photo – created a false impression about cellular agriculture, says Ben Wurgaft, a writer and historian who researched the industry for five years. In reality, the scientists grew thin sheets of bovine muscle cells – thousands of sheets, each no wider than a strand of hair – which they essentially fused together with a kind of meat glue. The process is “obviously not scalable,” Wurgaft says. 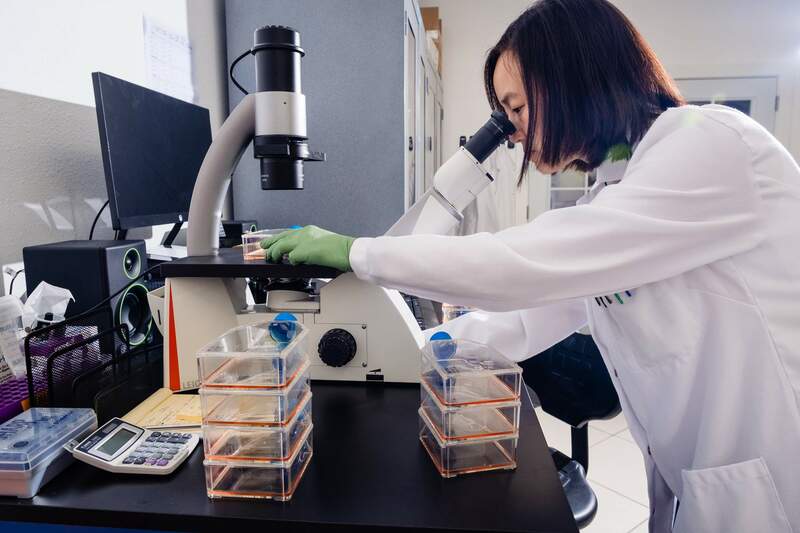 In a whitewashed room that smells like bleach, Jennifer Tung, a senior cell biologist for Finless Foods, actually does rely on something that looks like a petri dish. It’s called a cell-culture flask, and Tung uses a lot of them to keep bluefin tuna stem cells alive. It’s a standard part of the R&D process. 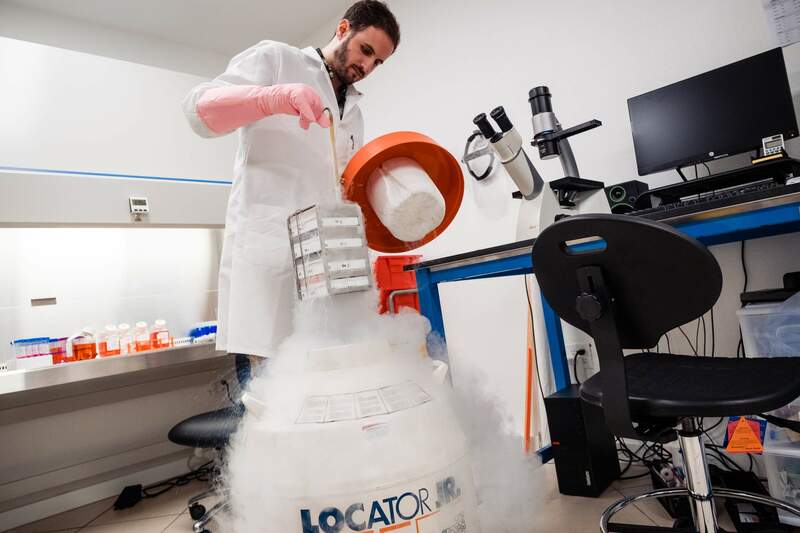 Each flask contains a thin layer of grapefruit-colored liquid – it’s the food, or “media” as its known in the trade – that allows the cells to grow. The only way to see the cells is under a microscope. Tuna ObstaclesOver on the east side of the San Francisco Bay, where Finless Foods has its offices, the seven-person team has yet to determine the exact food media mix necessary to give their bluefin tuna the proper flavor, ruby-red color and healthful omega-3 fatty acids that consumers desire. But they do have one advantage over the researchers who produced that cultured hamburger five years ago: The Finless folks have figured out how to grow three kinds of tissues from bluefin stem cells: Muscle, fat and connective tissue. They even claim they can manipulate the amount of fat to mimic the lush flavor of otoro tuna. 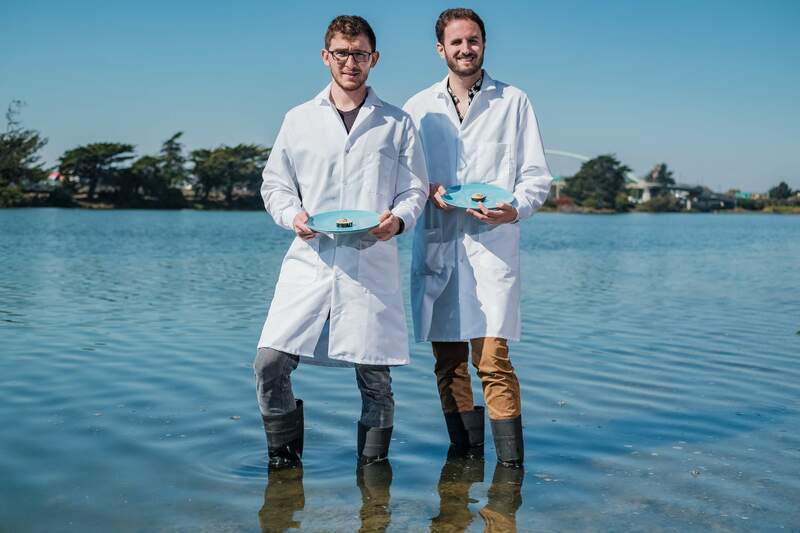 Selden and Wyrwas with Finless say they’re working on their own alternative serum, too, which they plan to have ready in time to launch their first bluefin tuna product – a paste that could be used in sushi rolls and other dishes – by the end of 2019 or beginning of 2020.